I especially love the bright colors brought into this. The only instruction I've got righ now is a tutorial that I made couple years ago. Do you need sth more or that's enough? Woah... origami, is there anything you can't do!? please include folding instructions of every piece used.. thanks! I really want to try and make that, I think it would be a very fun winter project. 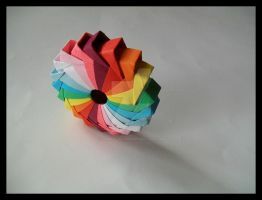 Do you have the tutorial or a website that teach how to put these modules togheter to make a vase? Please feel free to join #Origami-United if you haven't already, and please fave the news article if you enjoyed looking at all the lovely works of art! the first thing i had in my mind: how many pieces has this vase? How many pieces are on the top, and how many pieces are on the bottom? Amazing job. Can I get the step by step installtion? Thanks Do you mean, the instruction how to make a vase? 1200 Modules? Wow. How long did it take you to make that? lol I'm like the Origami Master in all of the schools I go to. well I'm not going to try now cause I start school, and I won't have much time, but when I start I'll ask for help oki? aaah! how come i've missed this one!? Tak jak ja dwa dni po tym jak go złozyłam i pozwoliłam mamie na Tv postawić do ozdoby ona do mnie przychodzi a ptaszor w częściach "Chciałam go przenieść i chwyciłam za skrzydełka i odpadły" No i musiałam składać I od tego czasu już nic nie tknęłam z origami.